LIONS CENTENARY AWARENESS DAY, 19th August. On Saturday, the 19th August 2017, Peterborough City Centre will play host to an event to celebrate the CENTENARY of Lions CLubs International. It will take place in Cathedral Square and will be an opportunity to find out what Lions Clubs are all about and what we do for communities. This will be a Lions ZONE (area) event so clubs from surrounding towns will be taking part. This is NOT a fund raising event but we are hoping to surround the Guildhall with tins of food to be donated to local FOOD BANKS after the day. If you will be in town that day and feel able to donate a tin or two please bring them along. The election took place at the June meeting. Well done to all of the above; we’re expecting great things from you all in the coming Lions Centenary year! Peterborough Lions hold a Quiz Night and hand over the reins. On Saturday 24th June, as a change from previous Race Nights, Peterborough Lions held a QUIZ NIGHT at Eye Community Centre. Tickets were £5 per person and included a buffet supper, prepared by Lions with the kind help of members of Eye WI. The sum of £255 after expenses was raised and ‘a good time was had by all’! The Club took the opportunity, during the interval, to also host the handover of the club Presidency. Lion President John Cheetham handed over to the new President, Lion Bill Peacock who listed the achievements of the club during the previous twelve months. He also installed his predecessor as ‘Lion Ambassador’. The Club intends to hold another quiz night, probably at about the same time in 2018. Look out for more details in the New Year. Peterborough Lions are well known for our annual quiz, but if challenging the brain cells isn’t your thing then how do you feel about beer and chocolate? Scattered around Peterborough and surround villages you will find our annual Easter Egg Chicks Raffle. Finding the eggs is easy: the wonderful pubs that are looking after them for us are all listed below, and the eggs are huge! The hard part is guessing which lucky number will win you the giant egg-shaped chocolate treat, or the cuddly second prize. How often can you say you’re off to the pub for charity? Go on, you know you want to…. Thank you to everyone who purchased quiz leaflets this year – your support is incredibly important to us and we are extremely grateful to everyone who joined in, whether or not you returned the quiz to us for entry into the prize draw. This year we had 950 completed quizzes returned , of which 52 had all 100 questions answered correctly. Well done to those 52, from whom the prize winners were drawn at the club’s monthly business meeting on 15th Feb. If you’re a winner you should be hearing from us soon. If you’re not, well there’s always next year! As always, a number of you found some equally correct answers to questions that we hadn’t thought of, so well done to you! The full answer sheet is attached – how many did you get right? Lions Clubs involve themselves in Community Services which can take all forms of help and support, and Peterborough Lions have been involved in a great example of this. ‘Little Dresses for Africa’ is a project to make dresses from pillowcases and other simple patterns. For many children living in Africa in impoverished areas, wearing smart clothes can reduce the risk of them being abused or abducted by making them look as if they “belong” to someone. Working to a simple basic pattern and using old pillowcases and other suitable fabrics the “HiJack Quilters” (also known as the Sewing Club of Eye and Market Deeping) have made a number of beautiful little dresses. The Club has been formed for 2 years and is made up of 26 Members; accomplished and not so accomplished sewers who meet weekly to sew together. The dresses were presented to District Governor Nigel Folkard at our November business meeting. Copies of the patterns can be made available if anyone is interested as this is an on-going project, so please do get in touch! Peterborough Lions were delighted to welcome District Governor Nigel Folkard to our November meeting. As well as providing a helpful update on events within the district, DG Nigel was also able to award several Lions with long service awards; Lions David Pope, Gaby Sharman, Di Parkin and John Hannington with awards for 35, 25, 20 and 15 years of service to Lionism respectively. C n y u fill the g ps? Peterborough Lions are proud to be supporting the National Blood Service “Missing Type” campaign, highlighting the shortage of blood across all three types: A, B and O. Until the end of August, our homepage logo will have gaps where A, B and O belong. Can you help fill those gaps? Visit www.blood.co.uk for more information today, and to book an appointment to give blood. The election took place at the May meeting. Well done to all of the above, we’re expecting great things from you all in the coming Lions Centenary year! It’s been another great year for the Lions’ Quiz, thank you once again to everyone who took the time to complete and return the quiz to keep our markers busy! Of-course the biggest thanks goes out to everyone who bought the quiz, whether or not you were able to return it. The funds raised from the quiz are incredibly important and will be put to fantastic uses. And also we mustn’t forget everyone who worked around the clubs’ volunteers to sell the quiz sheets, from a wide variety of shops and pubs to the charities and other organisations who sell them on a 50:50 basis to help raise funds for other great causes. But you don’t care about any of that, you just want to know if you were a winner, right? 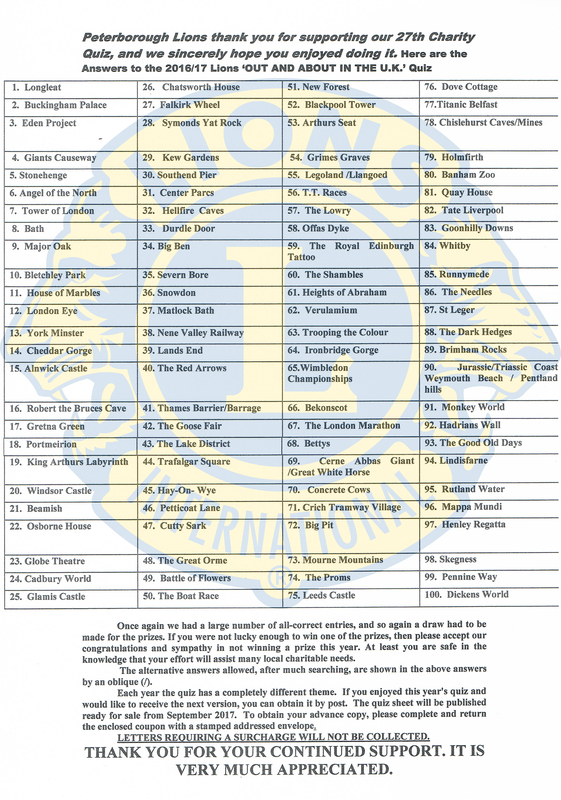 Here are the results of the 2015/16 Peterborough Lions Quiz, from the draw that took place at the club’s business meeting on Tuesday 9th February. In total, 903 quiz sheets were returned, 26 were 100% correct. If you won, then well done – your cheque is on its way! If you didn’t, well you’re in great company, and there’s always the 2016/17 quiz which will be out in September, and as always if you don’t want to miss out you’ll be able to buy them online! 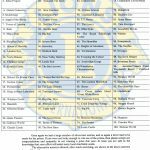 Anyone who wants to check their answers and get the solutions they missed can download the answer sheet here: Peterborough Lions Quiz Answers 2015. Congratulations to anyone who found a perfectly valid answer to a question that the quiz compiler hadn’t thought of – you can find the range of answers accepted on the answer sheet. If you managed to find more than one answer to any of the questions then you did very well indeed!